Our weather is warming up and for the past three or four days I have shifted from preparing chickpea stews, Mexican casseroles and pasta to fixing lighter vegetable dishes, salads and grains. For dinner last night we had a wonderful braised tofu and spice crusted carrots with harissa yogurt. What was so impressive about this Bon Appétit recipe was the crusted texture of the carrots, the flavor of smoked paprika, sweetness from a trace of sugar and a lots of lemon zest. Complex flavor; simple in preparation. My preparation is slightly modified from the original Bon Appétit recipe. I cut back on the sugar and did not rub the skins off of the carrots. Cook carrots in a large pot of boiling salted water until tender. Drain. Transfer to a bowl of ice water to stop cooking. Using paper towels, gently pat dry. The Bon Appétit recipe recommends using a paper towel to gently rub the skins off of the carrots. We used organic carrots and left the skins on. Mix sugar, mustard powder, paprika, cumin, and coriander in a small bowl. 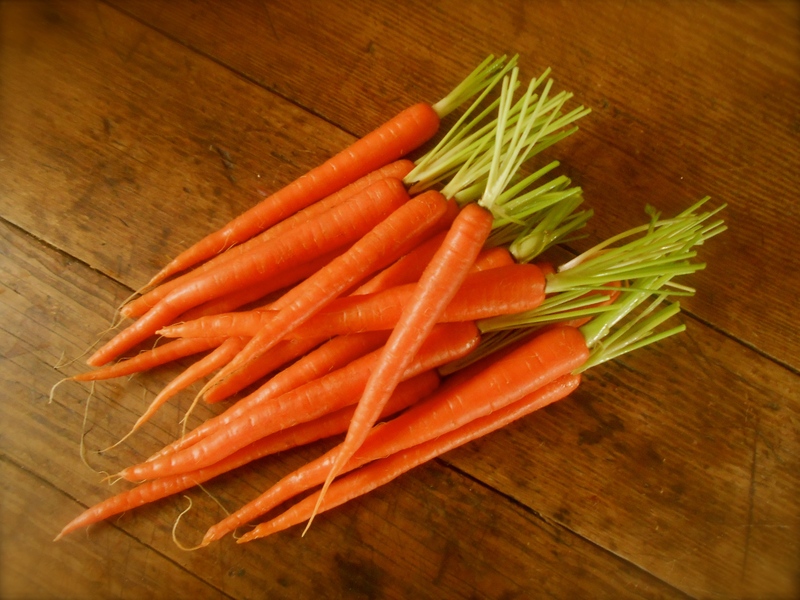 Toss carrots with 1 tablespoon olive oil in a medium bowl. Add spice mixture and season with salt and pepper. Toss to coat. Heat remaining 3 tablespoons olive oil in a large skillet. Working in batches, cook carrots, turning occasionally, until deep brown all over, 6–8 minutes. Season with salt and pepper. Meanwhile, place yogurt in a small bowl. Season with salt and pepper. Add harissa paste, 2 teaspoons thyme, lemon zest and gently swirl ingredients, stopping before yogurt turns pink. this looks like a great carrot recipe – giiving them an extra kick. Never thought of combining carrots with cumin! Brilliant! That’s why I’m so happy to have discovered (and to be following) your exceptional blog! Great recipe! :) That is exactly how I feel about your lovely blog Serena. Thank you for your kind compliment. I have absolutely no idea what is happening, but it is certainly troubling indeed. I’ve been getting visitors and views…I don’t know what to say. Have you tried accessing my blog on a different browser from what you normally use? I’ve even had one click-through to your blog, since I’ve listed you as one of my favorite blogs. Please let me know if you still can’t find me on a different browser, I’ll need to ask my hubby about this, as he is better technologically than I am. These beautiful carrots are perfect to pair with our sunny weather! Wonderful recipe. Yes! Thank goodness for a little sunshine…and warmer weather. These crispy crusted carrots go perfectly with a nice light meal. This could possibly be the cooked carrots I would eat. Not only are they beautiful but they sound absolutely delicious! love the spicy yogurt dip! Cooked carrots can be so boring, I usually always have some sort of dip for them, but these carrots are a different story! Instantly I was attracted to the Bon Appetite recipe with the sweet spiced “rub”. It’s takes carrots to a new level. :) Not boring. Yes exactly, they can be so boring. I love this recipe! Love the spicy dip, your pictures are so beautiful, even the one with just the carrots alone. I saw this in bon appetite, but now after seeing it on your site, I believe I will make this. You are too kind Cheri. I couldn’t resist the Bon Appetit recipe since I had harissa on hand. Very delicious and they do look beautiful. I love a good looking side dish! :) And carrot are quite photogenic, aren’t they! Yum! The crispy, spicy crust sounds amazing. That is exactly what made these carrots so wonderful! The crispy crust. A big improvement on just plain ol’ steamed carrots. Delicious. Harissa yogurt is my fave dressing for roasty vegetable salad type things, and with those carrots… Bang on! What a great way to enjoy carrots. You’d barely need anything else with these – they look delicious. That’s true. All by themselves is really all I need for a complete dinner. We do that sometimes, just have one vegetable and nothing else, well, besides wine, of course. That’s exactly what I thought when I was preparing these. The spice mix was so fragrant once it hit the skillet. Love this combination of spices! What a wonderful way to prepare carrots. As spring arrives and the first carrots arrive in the market, I will definitely have to try your version. I just started seeing some beautiful carrots in the market. Especially like the carrots in a variety of colors. Such an underrated vegetable! It’s lovely to give them a starring role on the table! Hope you do try them, it is a wonderful recipe. This looks really flavorful with the spices and yogurt – and lemon! YUM! Thank you….really was a nice blend of spices to use with carrots. Certainly enjoyed the crustiness along with the creamy greek yogurt. Delish! Harissa has been on my mind lately. This looks great, Seana. I bet your braised tofu was equally delicious. I saw some multi-colored carrots at the Co-Op recently. They would be gorgeous in your delicious recipe. I agree. I was going to buy the multi colored carrots for this particular post, but I just couldn’t bring myself to spend the outrageous amount for them when these crisp organic all orange ones were right next to them at 1/2 the price! :) I thought the photo’s would be must more interesting with the cool colored ones, but not at that price! Nice to hear from you today Shanna! Have a good week. I am with you and would have done the same. :-) They look beautiful and tasty, too. Happy Monday, Seana! I just visited (and loved) your ragu recipe! I am unable to leave a comment for you though. Hmmm. I wonder if I’m having issues with on my end or if the link is not correct. yeah, that’s what was holding me back…that is a lot of fuss over carrots so it better be worth it! It’s a delicious way to dress up the carrots for sure. At first I was a little unhappy to have the extra step of pre-cooking the carrots, then once it was all said and done (and they were delicious) I didn’t mind dirtying the extra pot. I’d be happy eating these any night of the week! I love these flavours that you’ve used Seana! Hi Leah! Do try…this is a very unique way of enjoying carrots. We loved them. This might actually get me eating carrots! They’re so good for you. But, apart from raw and roasted/caramelised I’m never keen on them. Without the yoghurt would these go with hoummus? Smoked paprika is a miracle ingredient. Those carrots look great. I must agree with you Michelle. I’m very keen on smoked paprika. I am a new fan of harissa yogurt and so glad to have discovered it. I think you would enjoy these carrots. They are something to write home about. :) Thank you for stopping in this evening Ken. So nice to see you here. so pretty :-) Carrots sound lovely right now–especially as you’ve prepared them. Oh yum! Good evening Liz. Thank you and hope you are having a good start to the week. Carrots do sound good right now! Carrots and cumin??? It sounds really tasty! Perfect combination and cumin has so much flavor, so good. I would have to say cumin is probably my favorite spice. It is so unique and I simply can not get enough of it. I love it on steamed rice with a little cilantro too. So good. Brilliant! I’ve been thinking about spiced and roasted carrots all week. Must have known you will be posting this recipe! Our minds must think alike! :) Carrots are so lovely right now. Love them like this. Gorgeous pics and yummish recipe! Thank you! I hope you’ll be able to find them too. Carrots are one of those forgotten vegetables. They seem to always be used in soups or stews and we really enjoyed them as a side dish like this. Hi Deena, thank you, I must agree. Blanching the carrots first, then crisping them in the skillet was a perfect cooking method for such a hard root vegetable. I just had Harissa veggies for dinner this evening! What a funny coincidence. Yours sound delicious, love the addition of mustard and thyme! I’ve never used harissa on vegetable before Gab. That is interesting! I’m going to try some other vegetables too. I really love harissa and it is actually a new found treat in our kitchen. I put the harissa on eggplant, capsicum, zucchini and mushrooms, it was lovely! Harissa is relatively new in our kitchen as well, but it’s a welcome addition! Yes, please! As the snow has started to melt, I just uncovered some forgotten-about carrots that have overwintered. It seems to me they deserve a special preparation and this is just the ticket! I really love smoked paprika. you are right it is so much better than plain, it’s almost as though it is a completely different spice altogether. I seem to be using it quite often these days. Carrots usually bore me, but this looks like a recipe I could try… Nice post!! I’m so bad with the following/commenting thing. I read so many blogs like yours that I never actually take the time i should to comment on the posts I like… Anyway, thanks for the lovely complement and keep up the great creative work!! I think I’ll plant carrots too this year. We skipped them last year and they certainly were missed. Hope you are enjoying this sunshine as much as I am! Here comes the rain again…over the weekend. The Fates have conspired to bring me to this recipe. Just today I received my first CSA delivery and within it was a bunch of carrots. This past Sunday I made a batch of harissa. See? I was meant to find and prepare your recipe and I cannot wait to give it try. It really does sound good! I’ll be posting the recipe in a few weeks. If you’d like to see it earlier, I’ll gladly email it to you, understanding that you are under no obligation to prepare it. :) As it is, I combined the recipes of 2 fellow bloggers and view mine as a work in progress. You know Seana.. you just have a way of making everything so beautiful..so stunning… so incredible…so delicious. I made this tasty side dish yesterday & loved it so much, my friend! DIVINE FOOD! Love cooked carrots–but have never had them so spiced. these do look perfect. thanks. 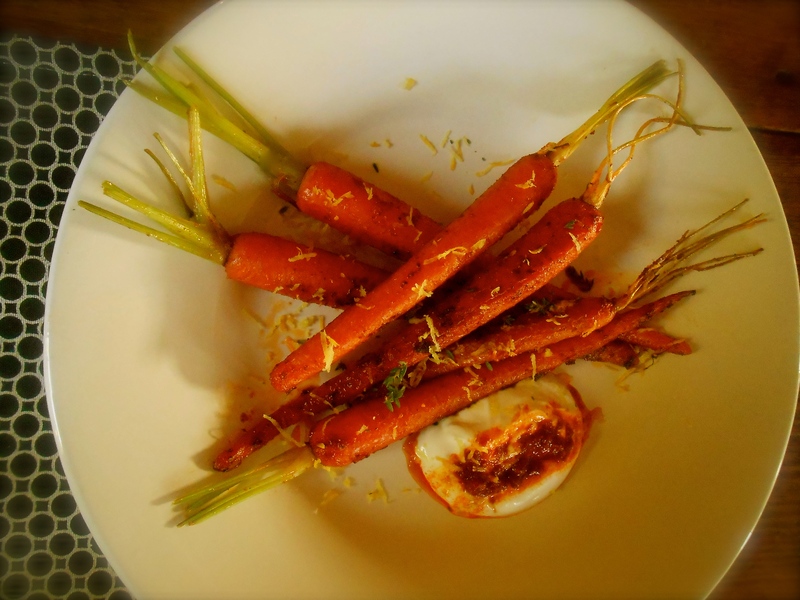 You are currently reading spice crusted carrots with harissa yogurt at COTTAGE GROVE HOUSE.